ATS Springs has a complete line of Grade 8 Spring Eye Bolts and Hanger Mounting Bolts with locknuts and washers. We also provide a full line of Grade10.9 metric bolts. We prefer to provide the top grade bolts with our replacement leaf spring hanger brackets and leaf spring shackles for the best install. Our Grade 8 bolts are a definite improvement over the rivets used on the original components for your pickup truck, van or SUV. ATS Springs is unique in providing the top grade replacement bolts for your suspension. ATS Springs offers leaf spring accessories to help maintain the proper condition of your leaf springs. Replacing worn leaf spring tip inserts will help maintain proper leaf spring performance. New spring inserts, also known as wear pads, can protect your leaf spring and solve any possible squeaking or grinding noises. Kwik clips, also known as leaf spring bend over clips, help keep your leaf spring pack together. ATS offers different size spring clips that fit various width leaf springs. The new leaf spring clips can be installed without removing the leaf spring from the vehicle. OEM Replacement Leaf Spring Center Bolts, (Center Pins). 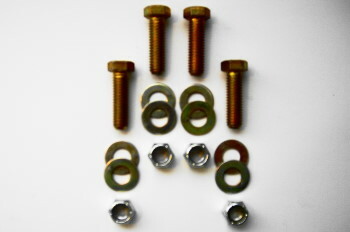 Leaf Spring Hanger Mounting Bolt Kit 3/8"x1-1/2"
Leaf Spring U-Bolt Thick Washer Kit 3/8"
(1) Special Head Center Bolt with Nut.